Perhaps you’ve never bought a Pinterest course. Or maybe you’ve purchased ten of them! Before you purchase another one, I’d like to share a set of criteria that you can use to evaluate whether that course is worth the money. On today’s podcast, I’m interviewing Melissa Culbertson of Blog Clarity. She has created a series of courses to help online business owners grow their business authentically, through great content and smart marketing. Her blog is her “side hustle” and her passion. She’s been in the marketing world for over 18 years. She’s currently the assistant manager of brand engagement with digital (meaning she gets to work with content strategy for social media) for Burt’s Bees! I first found out about Melissa in 2013 when I needed help figuring out Pinterest. Her Pinning Perfect course was so easy to use and it really propelled me to a knowledge of how to effectively use Pinterest. 📌📌 If you are interested in purchasing Pinning Perfect to move the needle forward in your Pinterest marketing, save $30 off the regular price right now with promo code 3DAYSALE19. Available through February 13th only! CLICK HERE to sign up. One of the reasons I wanted to do this episode was because I always get asked about great Pinterest courses. For a lot of people, they’ve purchased multiple courses, but feel like they haven’t hit the jackpot yet. Others just don’t like using Pinterest and are confused by how it works. 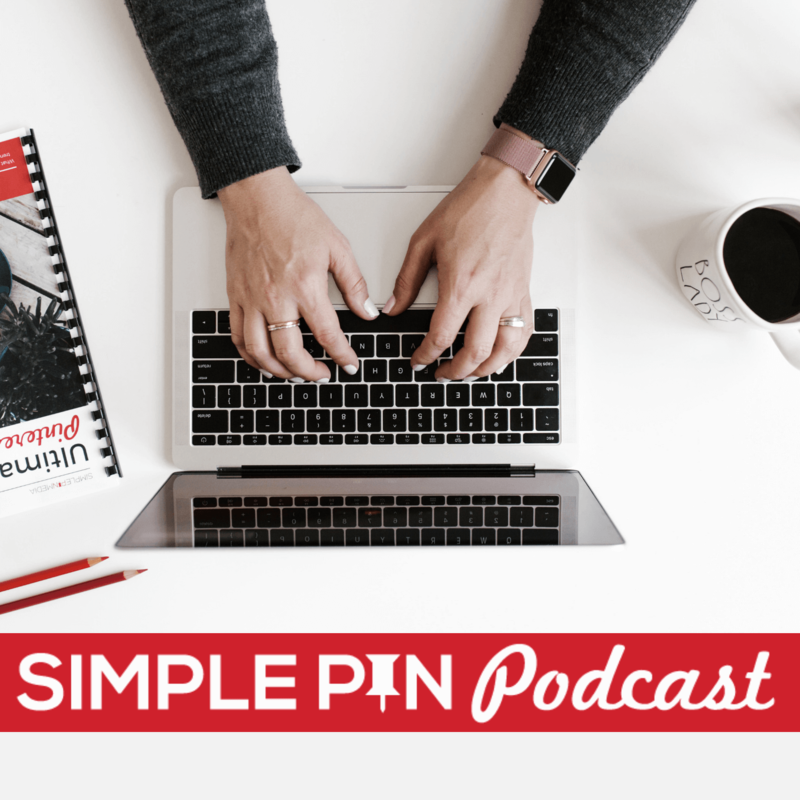 I want this episode to be a great resource and guide so that you can understand the why behind buying a Pinterest course. The first factor to consider when selecting a great Pinterest course thing how often the course is updated. In my opinion, this is the most important consideration. We all know that social media changes so fast and the best practices of 2013 won’t work today. Because of that, frequent, regular course updates are vital. And make sure that you have access to the updates as part of the initial purchase instead of having to purchase each new update. Your Go To Pinterest course should be updated at least every six months. Also, the course creator should inform students (via email, a Facebook group, etc…) of all minor changes. It’s also important to look at the FAQ page or the product description for the course to find out what tools they focus on within the course. Email the course creator to find out what Pinterest scheduler they use. We all know that you can’t publish a blog post and expect to be ranking the very next day, or even a week later. It usually takes 3-6 months to see results on Pinterest. You might see a sales page that promises millions of page views in a short amount of time, but that’s just not how it usually works. Slow and steady wins the race on Pinterest. On Facebook and Instagram, you get some instant gratification with those likes, but with Pinterest, you’re waiting on traffic. And that takes time. If you come across a sales page that promises quick results, proceed with caution. After being in the Pinterest game for 5+ years, we know that it’s rare for someone to explode on day one. A person might get on Pinterest, do one thing differently during the months of October through December (which are high traffic months), and find that their traffic goes up. It’s as if they found golden treasure and they suddenly create an ebook or a Pinterest course based on a technique they used that’s very particular to them. I never want you to buy a course by someone who just started blogging and hit the jackpot 3 months later… and wrote their course 2 months after that. That’s just not enough experience with the platform, and that course will likely be directed at a very specific audience. A + B doesn’t equal C in every situation. There are times when business is overwhelming, and we don’t have time to listen to a whole podcast and we just want to read. Or times when we don’t want to read, but would rather watch a video. And sometimes, having a group to talk to is helpful for quick answers when you have to no time for researching the answer to a specific question. Pay attention to what the sales page says about the product to know if it will suit your particular learning style. It helps to have social proof that other people have taken and enjoyed the course. Check out the course page for testimonials, but remember that those testimonials are handpicked by the instructor. Go into Facebook groups and use the search feature to find more conversations and reviews of Pinterest courses. Search for the name of the course you’re looking at and read what other people have to say about that specific course (pro and con lists are super helpful). You can also conduct a basic Google search for reviews or blog posts about a particular course. People write reviews on these courses to help you make an informed decision. We hope that these five steps help you find the perfect Pinterest course and that it’s really successful for you. Make sure you check out Melissa’s Pinning Perfect course. Her course page covers a lot of information. If you have questions about the course, feel free to send her an email. Her course is open all the time so you don’t have to worry about waiting to join. And she offers an incredible bonus: 20 pin templates for Canva and Photoshop. Through February 13th only, use promo code 3DAYSALE19 at checkout to save $30 off Pinning Perfect! These 5 things to consider when buying a Pinterest course is a great help, especially to new Pinterest content creators like me. Thanks! you made excellent points about avoiding a “quick results” bait, etc. My main concern is that Melissa’s own Pinterest account has only 147.6k monthly viewers and 12,651 Followers.